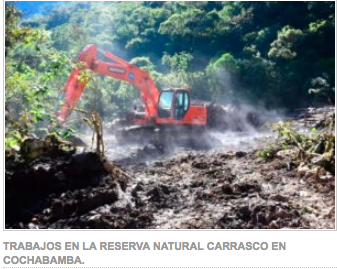 Carrasco Reserve will lose 541 hectares of forest to cheap demagogue! The coca caudillo’s government that self-appointed as Mother Nature defender, proved to be nothing but an insult to our wildlife! Chinese Sinohydro is the company that got awarded this project, under serious doubts of lack of transparency. Moreover, the Chinese that came to Bolivia under this ochlocracy have been found guilty in many occasions for promoting the killing of jaguars for their teeth …! In sum, it is a despicable action of this demagogue populist government that places in jeopardy our biodiversity, there was NO other government in history that promoted such destruction, the Madidi Park is under jeopardy for the same type of project. While in the whole world the trend is to avoid and/or destroy dams, here this delusional and inept government continues with this nonsense! The above is the opinion of Bolivian Thoughts! The Carrasco National Park of Cochabamba, which in its 622,600 hectares concentrates mountains, hills, valleys, plains, hillsides, waterfalls and a tropical forest, will suffer alterations in its structure, since the works started for the construction of the Ivirizu hydroelectric plant, which will destroy 541 hectares of forest until the year 2021, in charge of the company Sinohydro. In recent days, the environmental impact is more than evident, native species are seriously affected and wild animals flee in terror of the place because of the noise of the engines. This entry was posted in Bolivia, Cochabamba, Drug war - narcotraffick, Energy, Environment, Politics, Social Unrest, TIPNIS and tagged democracy in peril. Bookmark the permalink.